Continuing on with part 3 of our meal replacement reviews, we'll take a look at Labrada Lean Body and Lean Body For Her. Lee Labrada was one of my favorite bodybuilders many years back, I especially admired his symmetry. :) Now he's got his own line of Labrada nutrition products. 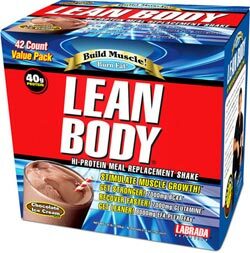 Labrada Lean Body is a popular product that's got a good amount of protein and nutrients, and it has a pretty good taste. It's got chocolate, vanilla, peanut butter, wild berry, and some others. The Lean Body meal replacement also comes in a low carb formula, and also a specially formulated version for women. Okay, let's take a close look and see what's in Labrada's Lean Body mixes. Each box comes with 20 or 42 packets, and each packet provides 40 grams of protein, 330 calories, 24 grams carbs, and 8 grams of fat. Aside from this, Lean Body contains a host of other excellent nutrients: L-Glutamine, Riboflavin, and a bunch of other vitamins and minerals - so it's packed with good stuff. Labrada Lean Body also has phenylalanine. The Labrada meal replacement drinks are some of the better ones you can get. You can expect to pay around $45 to $90 for it - roughly the same as Isopure and Myoplex. 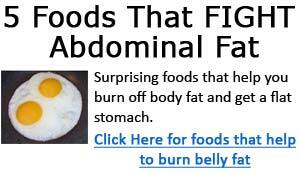 For the quality of nutrition, it's definitely worth the money. Click the links below for great price and great customer service.